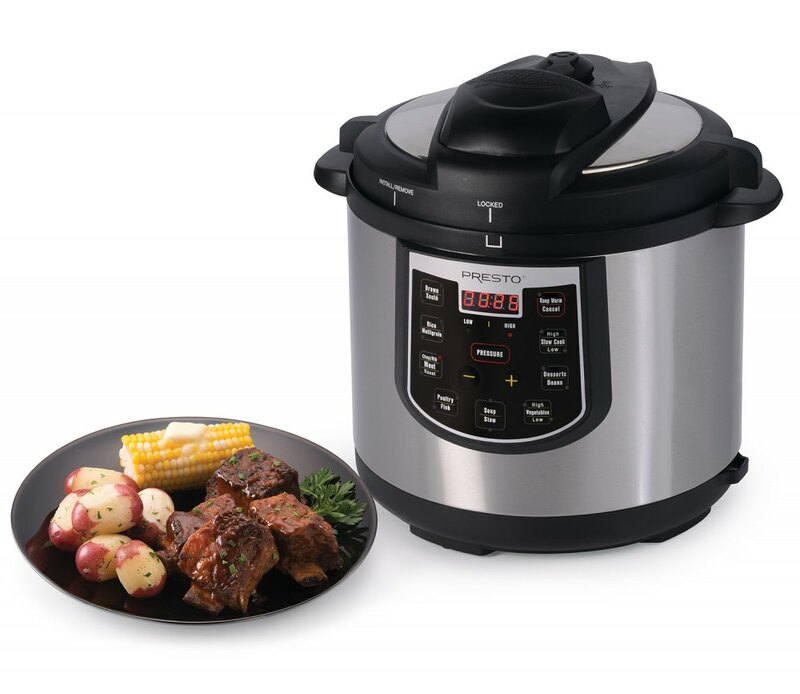 Pressure cooker and slow cooker in one handy appliance. Fast and easy, just set and the rest is automatic. Nineteen programmed settings including high pressure, low pressure, slow cook, brown, sauté, and keep warm. Twelve pressure cooking presets for meats, fish, poultry, vegetables, rice, multigrains, beans, soup, stew, and desserts. Cooks healthy, flavorful meals. High-speed pressure cooking preserves flavors and nutrients. Even tenderizes less expensive cuts of meat. Cooks up to 70% faster than ordinary cooking methods. Saves time, energy, and money. LED display counts down the remaining cooking time. Special rack cooks several foods at once with no intermingling of flavors, colors, or odors. Timer signals when cooking time is complete. Cooker switches to keep warm at end of cooking time to let pressure drop on its own. Easy cleanup. Removable pot with nonstick surface inside and out is dishwasher safe. Eight built-in safety features including a cover locking system that allows pressure to build only when the cover is securely closed and prevents the cover from being opened until pressure is safely reduced. Digital controls plus LED display that counts down remaining cooking time. Quick pressure release valve and cover lock. Removable pot with nonstick surface for easy cleaning.